Unfortunately, for military families the risk of over-improvement is very real. As military families move on average once every three years, the risk of buying a home and over-improving it through renovations is deceptively easy to do. A few years ago, my husband and I were invited to a fellow military family’s home for a backyard barbecue. The entire home and backyard was stunning, and it felt like we were stepping into the pages of a magazine. Wisteria hung from wooden porticos, lush flowerbeds overflowed their boundaries, and raised gardens offered the latest summer produce. Equally impressive was the interior of the home, with its floor and fixture renovations, an enclosed garage converted into a family room, custom granite countertops, and more. Gorgeous as it was, the couple had sunk far too much money into the home. PCS orders came, the home was too expensive for what the market would bear, and it wouldn’t sell. They decided to rent – and hope the market would improve. But, things went from bad to worse when tenants who didn’t have the energy or ability to maintain the grounds ended up killing off most of the gardens. This poor family eventually sold at a significant loss and never made a return on their home. 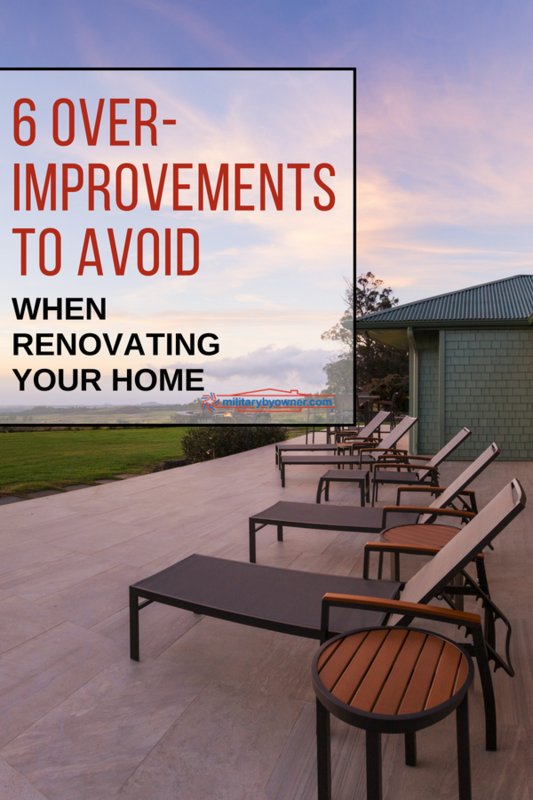 With a never-ending rotation of home improvement shows, Pinterest lists, and Instagram campaigns, it’s hard not to catch renovation fever, but before you swing that hammer – keep these over-improvement risks in mind. Who doesn’t want more space? Extensions can be one of the most costly renovations, as it involves creating new walls, foundation and roofing, and may also bring hefty building permit fees from your city or county government. Additionally, extensions not built correctly can affect the load-bearing weight of a roof and a home’s supporting structures. Extensions and conversions must be compliant with local and state building code, fire safety, and exit egress. If any of these areas are problems in a future buyer’s appraisal, a sale will come to a screeching halt. A home’s value is comprised of several factors, which are variable: market desirability, what other homes in the market are selling for (area comps), and what a future buyer actually perceives as “value." My husband and I learned about personalized renovations the hard way. We thought we’d created a beautiful accent wall when we repainted our living room. To us, we chose a lovely shade of what Home Depot called “Butternut” that reflected morning sunshine. Would-be buyers, however, saw a garish shade of yellow that reminded them of a school bus. We eventually had to repaint the entire wall to garner any offers. If you are considering renovations, aim for timeless upgrades with a simple and clean design and a neutral color palette. Also remember, the latest contemporary “popular” design can quickly look dated in a few years, so choose textures and style carefully. 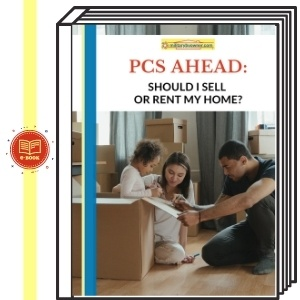 As a military family, moving is pretty much guaranteed, but there’s also the risk of a short, no-notice PCS. If this home had to be rented out and tenants damaged the property, how easily could any custom renovations be repaired? Costly upgrades can quickly erode any equity that had been building in a home. Remember, whenever you do decide to sell the home, at a minimum to break even, your sale price will need to be high enough to also cover real estate agent fees (an average of 6%) in addition to your share of any closing costs, which average 1-3% of sale price. Additionally, too much money sunk into renovations can leave you in a position to lose money if you try and sell too soon and force you to ride out the market, hoping for aggressive appreciation to recoup renovation costs. It may come as a surprise, but over-improving a home can actually make it harder to sell, especially if it’s the most expensive one on the block. A house that is priced too far above what other homes are selling for is going to be met with one question: “Why?” What is it about this home that has it priced above comparable homes? If renovations out-price what the market will actually bear, the house will be difficult to sell at a price point to recoup money sunk into it. If a buyer is paying top dollar in comparison to other homes, where is their future appreciation going to come from? If no buyer can answer that question, a house is overpriced for its market and will not sell. If you are evaluating renovations, choose areas that historically provide a solid return, such as kitchen and bathroom updates. Aim for clean, simple design elements using construction methods and materials that can easily be replaced or duplicated if damaged. One of the best things you can do before undertaking any renovation is to determine a home’s existing price point. What is the home currently worth on the market? You can get a ballpark estimate through real estate search engines, but a local real estate agent will be a more accurate in-the-know information source. It costs nothing to ask what a home, either yours or one on the market, is worth. A little strategic thought can determine which renovations your family can both enjoy and recoup. About the author: Kristi Adams is a proud Air Force spouse and served on active duty herself as a Space and Missile officer. She is an Associate Professor for the University of Maryland’s School of Architecture, Planning, and Preservation and holds a Master of Real Estate Development degree from the university. She and her husband have profitably owned rental properties since 2004. When Kristi isn’t writing about real estate, she’s writing about travel and has been published in several books and national publications. Find more of her writing at Kristi Adams Media.